Rumors: Star Could Stay with Thunder on 2- or 3-Year Contract, Russ Hosting Party Tonight. 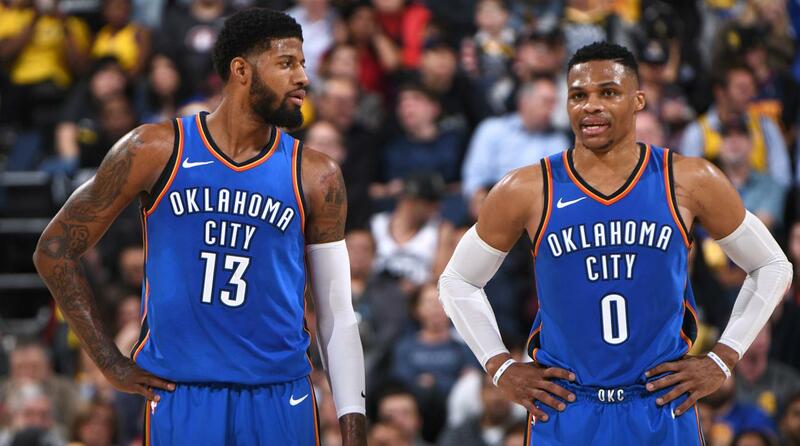 Paul George signing with the Los Angeles Lakers this summer has long been viewed as an guarantee, but on the eve of free agency, it appears as though there is a real possibility he remains with the Thunder. It was just last summer that the California native told the Indiana Pacers he would not sign an extension with them because he would prefer to play for his hometown Los Angeles Lakers. While some teams may have been hesitant to pull the trigger on a trade knowing he could be just a one-year rental, Oklahoma City boldly took a chance on him. George averaged 21.9 points, 5.7 rebounds and 3.3 assists in his first season with the Thunder. While he enjoyed individual success, the team had to battle all season for a playoff spot and was bounced out of the first round by the Utah Jazz. ESPN.com’s Royce Young reported that the former NBA MVP is hosting a “summer hype house party” on Saturday night, although the reason behind the party is not clear. George reportedly arrived in OKC earlier in the day, so it’s possible that the shindig could be related to his decision in some manner. Then again, Westbrook could just be trying to live it up this offseason. Per Young, there will be 500 guests and a “surprise performance by a multi-platinum artist,” with Nas as the rumored performer. Attendees will reportedly have to sign a non-disclosure agreement.